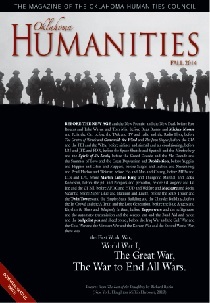 The Oklahoma Humanities Council recently published a special issue on the 100-year anniversary of World War I. I wrote the opening article. The entire issue is well worth reading and can be downloaded here. This entry was posted in Uncategorized by johnkinder2014. Bookmark the permalink.